While my parents gave me the middle name 'Marie' I'm pretty certain it should have been procrastination! 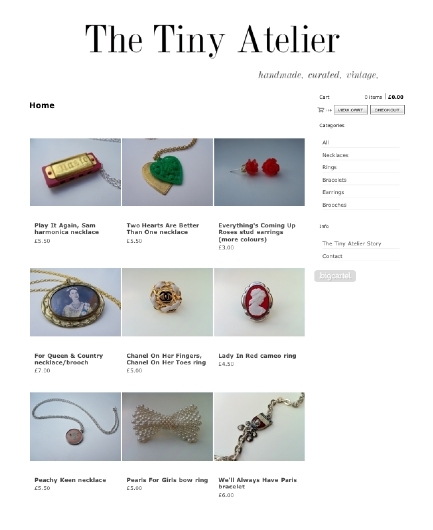 I can't remember how many months it's been that I've been saying I would stock The Tiny Atelier shop again, and this time do it properly, but it never happened...until today. With two weeks holiday from work coming to a close, and a lack of things to do thanks to my still healing ribs, I grabbed a few photos and started uploading. The whole store, layout, fonts, banner etc was already done so it was pretty quick and easy. Hopefully the weather will be OK tomorrow so I can go out into the back garden with the cat (who is now under supervision due to climbing and getting stuck up a fence - the whole adventure ending with me up a step ladder so he could clamber onto me and then hide in my coat!) and get some more snaps and upload while the F1's on.